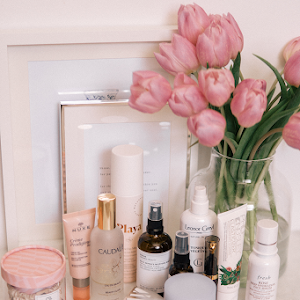 If you had a peek at the first installment of my Korean Skincare & Makeup Haul, you'll know that I eluded to a part two and today, here we are. 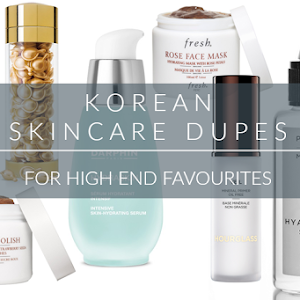 There's a little to appease everyone, including a couple of saucy dupes for high end favourites. 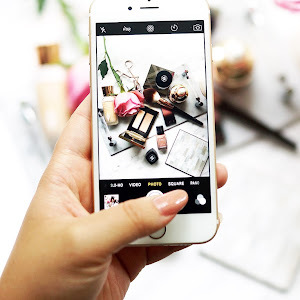 And should we care to take a minute to 'appreciate' my impressive and somewhat overzealous strewing of flora in today's photographs, there are many, more desirable suggestions to jazz up your photography in my 12 Easy & Affordable Blog Prop Ideas post. A quick nod also, as it's relevant, to probably the world's first nanodiamond serum(?!) 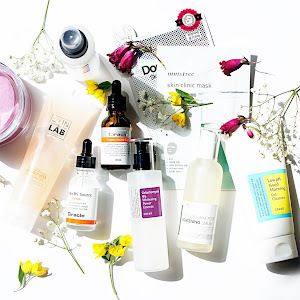 - I was lucky enough to try this Korean breakthrough, and you can have a good sift through the waffle of my first impressions here. 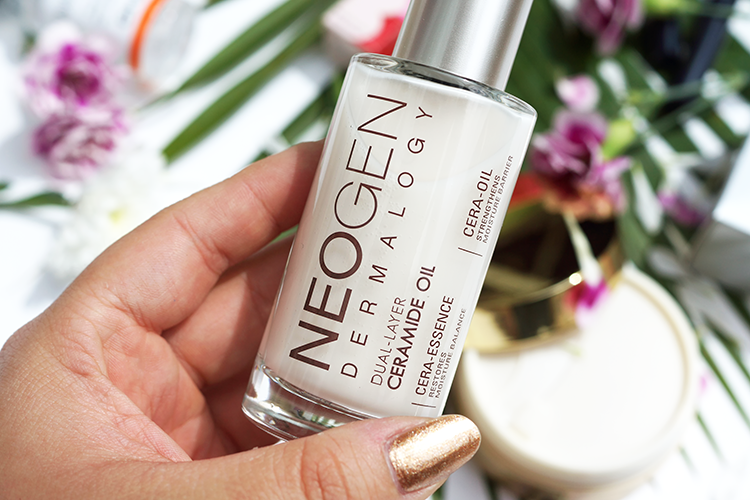 Neogen Dual Layer Ceramide-oil $30 (although you can get it here from eBay too if you're that way inclined) | I am thoroughly excited about this one. A hybrid skincare item from Neogen (a brand I'm really enjoying and there may well be a haul coming up on more Neogen products in the very near future....), a combination of beauty oils are suspended within an essence containing a veritable glut of botanical extracts and skin benefitting actives, including skin-fortifier and favourite ingredient of mine, ceramide. It feels superlative on the skin. 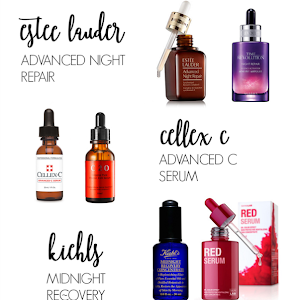 Perfect for those who aren't yet thoroughly convinced about facial oils, or who want a less greasy texture, for those who want something light, yet moisturising, or for the rest of us that just want a do-all, mid-routine skincare item that has a fantastic list of ingredients and promises to provide results. 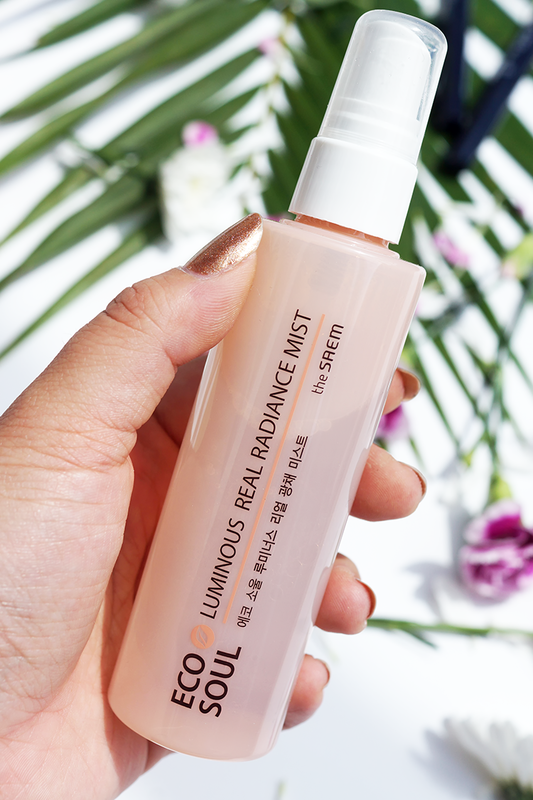 The Saem Luminous Real Radiance Mist $12 | Hydrating facial mists are the god-send for midday spritzers, weary travellers, or anyone that needs a quick refresh. And I love them! This one by The Saem is a double layer mist, with goodies like propolis, hyaluronic acid and argan oil suspended within a red berry ferment water. 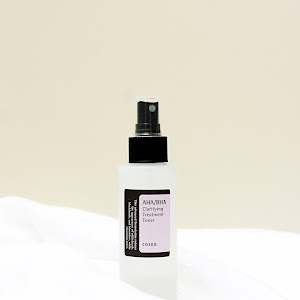 I give it a shake and my skin a spritz and it's instantly refreshing, brightening and moisturising, far more so than just a water mist, and the oils don't feel in the slightest bit greasy. My skin looks bright and enlivened in a flash. 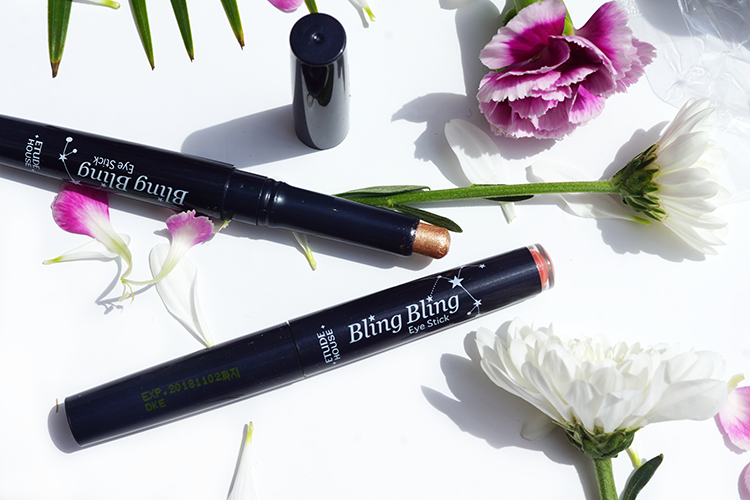 Etude House Bling Bling Sticks $5 a piece | Eyeshadow crayons are by far my favourite way to get a little colour onto my lids, the simple, foolproof application is a dream for us busy bees and low maintenance misses. I picked up shades #8 Ivory Baby Star and #11 Rose Star, a super metallic champagne-gold and corally-pink with gold microglitter, both of which are creamy and pigmented, gliding right onto the skin with ease. 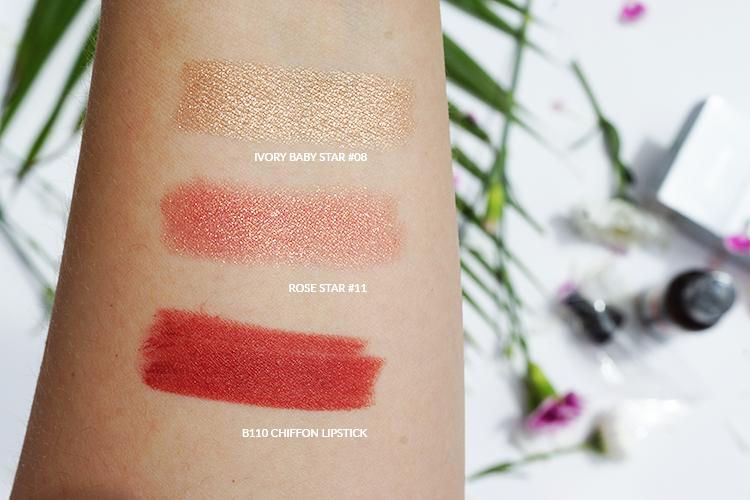 Rose Star is stunning, quite unusual and perfect for a radiant, summer look. They're not bulletproof in staying power like the ByTerry or Laura Mercier shadow sticks but working in light layers and building up colour gets me a longer wear from them. 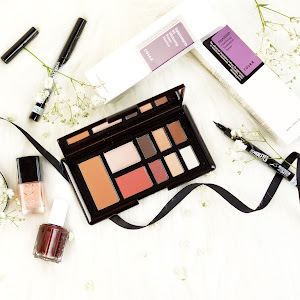 I was lucky enough to pick some bits from purveyor of Korean beauty, Jolse, which due to their sweeping spread of stock, wasn't an easy task, but someone has to do it right?! 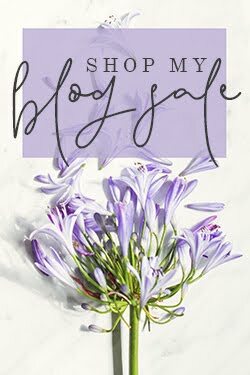 Jokes aside, they have an excellent range, from bargain to high end, everyday favourites to obscure, so I tried to choose a varied spread. 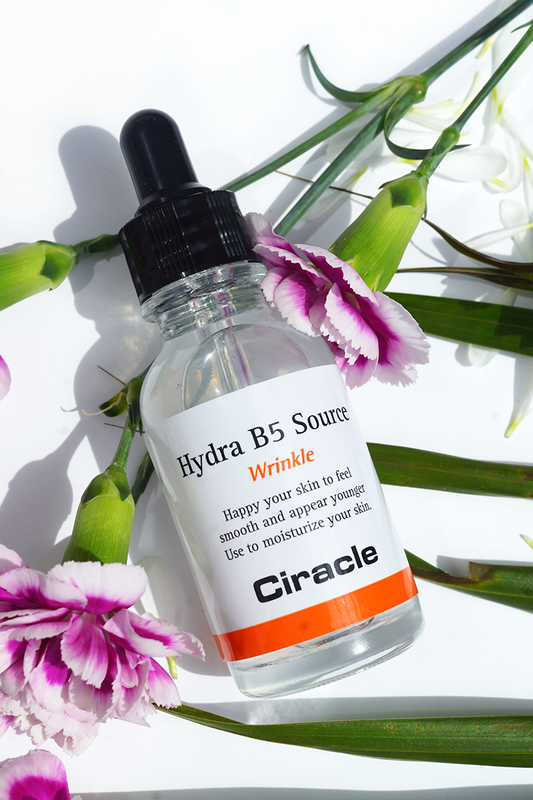 Ciracle Hydra B5 Source $20 | A similar and cheaper alternative to the coveted SkinCeuticals B5 Gel, this lightweight, hydrating gel-serum gives uber hydration to the skin, sinking right in and leaving your complexion feeling the kind of plump and 'chok chok' that puts an extra skip in my step (for more on 촉촉 or chok chok skin, check out this tutorial). With ingredients like niacinamide, sodium hyaluronate, adenosine, panthenol and beta glucan, this really promises to perk up your complexion and rid any fine lines or crepey-ness due to dryness. 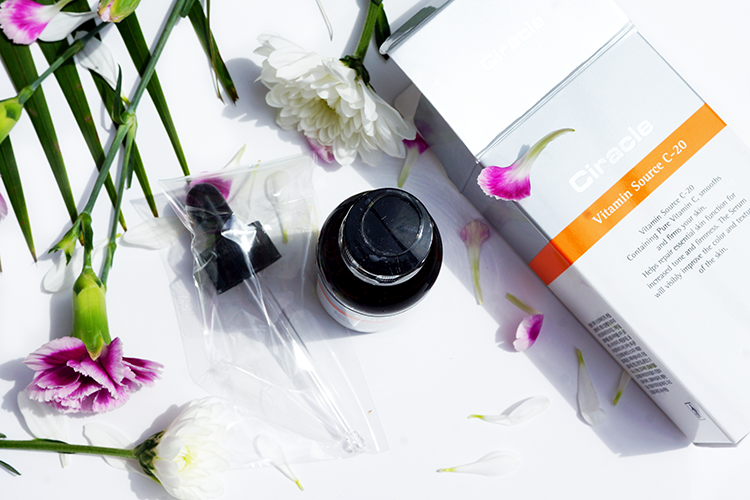 Ciracle Vitamin Source C-20 $30 | Brighten me Vitamin C! 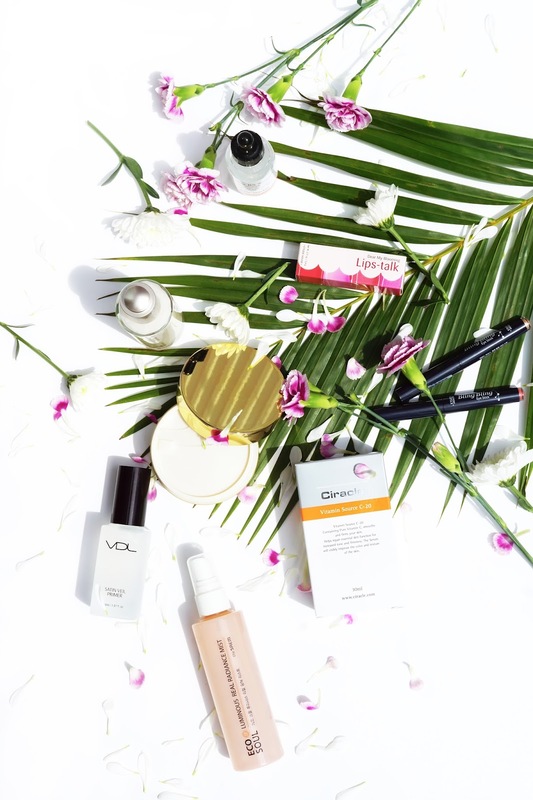 Vitamin C products are some of my very faves - they brighten, firm, correct hyperpigmentation, and I often see the most noticeable results with them. This one contains 20% or 6000mg L-Ascorbic acid, vit C in it's purest and highest-quality form, and move over Brangelina (substitutable with any other power couple) as combined with the Hydra B5 Source, this is supposed to give super duper results. I appreciate the attention to packaging, with a sealed, dark, glass bottle and separate pipette to keep the contents fresh prior to use. 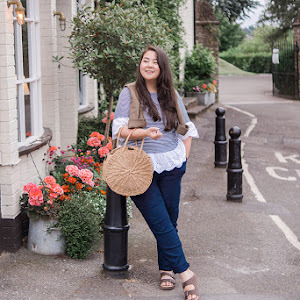 I'll absolutely be back with a before and after - so keep those eyes peeled! 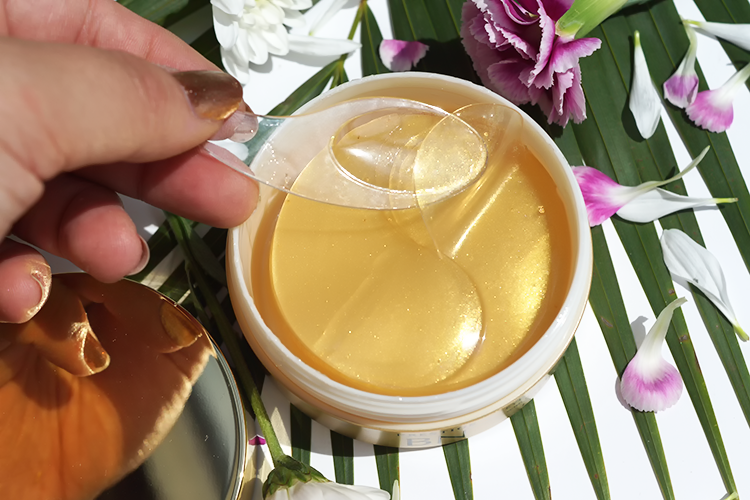 It's Skin Prestige Gold Eye Patches $25 | I was hopelessly attracted to these under-eye masks from It's Skin, containing little speckles of gold, as well as a whole host of delicious ingredients like niacinamide, adenosine, seaweed and bird's nest extract. Instead of cotton, the tub is full of satisfyingly stacked pairs of hydrogel slivers, enough for 25 uses, that, as flobby and slippery as they first seem, adhere handsomely to the under eye area and instantly cool, soothe, hydrate and depuff. With an ingredients list as good as this, I'm actually hopeful of seeing longer term results, so I'll definitely be back with an update/Before & After to fill you in. 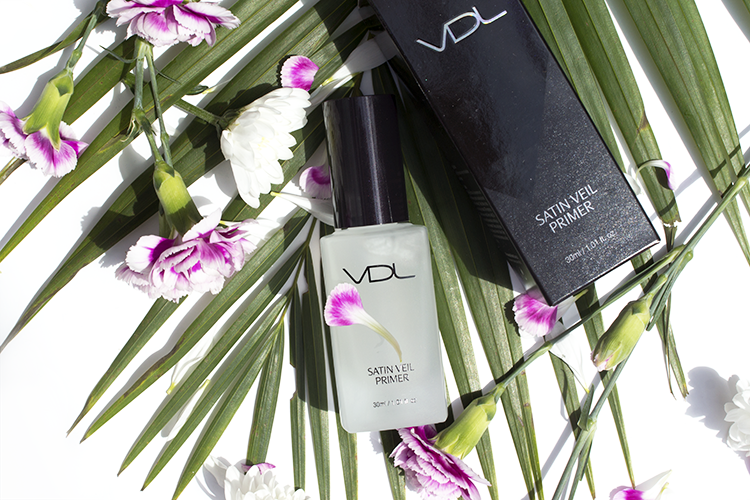 VDL Satin Veil Primer $15 | Supposedly a dupe for the Hourglass Mineral Veil primer (you can already see the similarities in the packaging with the luxe, frosted glass bottle and dark, metallic lid) this thick, silicone primer from uber-cool Korean cosmetics brand VDL promises 'glassy, smooth skin as if wearing a silk veil'. Smoothing this over the skin is effortless and my skin seems transformed with a soft-light effect that's supremely flattering. And what a steal for it's dime-a-dozen price tag. 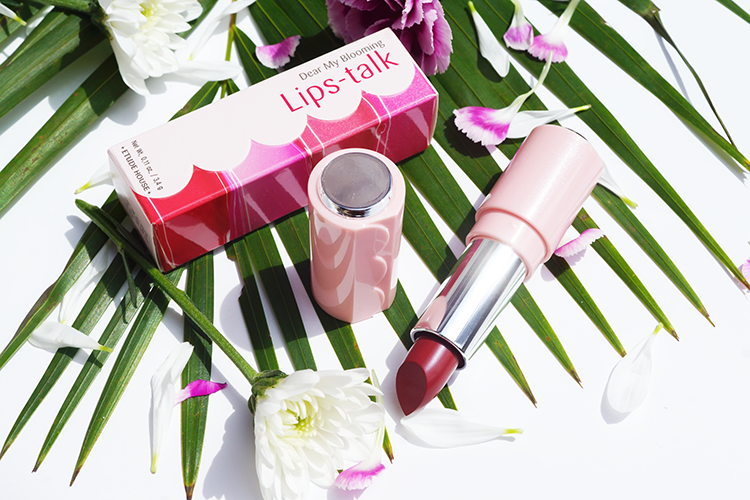 Etude House Dear My Blooming Lips Talk Chiffon in B110 $8.50 | Etude House recently launched a brand new formula of lippies and I opted to try one of the 12 shades on offer. With a thin and light texture, the Chiffon lipsticks mix the softness and moisture of their Cream formula, with the long lasting power and vibrant colour of the Mattes. B110 is beautiful, a russet-brick, but elegantly subdued, red - it's extremely similar to Tom Ford's Negligee, one of my favourite lipsticks. 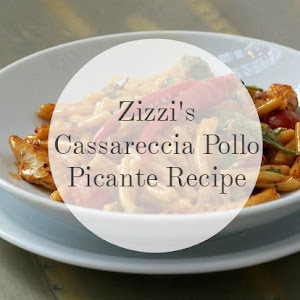 I like rubbing this into the lip with a finger for a quick-yet-refined on the go lip that's great for a lunch (or otherwise food-orientated) date. Hope your enjoyed seeing Part 2 of this haul! Make you check out Part 1 and I'll be back with followup updates and some more goodies to share with you. 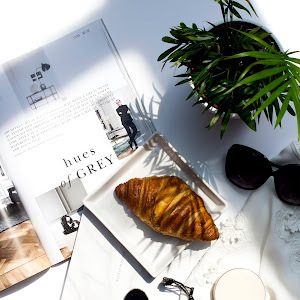 P.S Have you seen the Hera Cushion Foundation? It's up there with the absolute best. 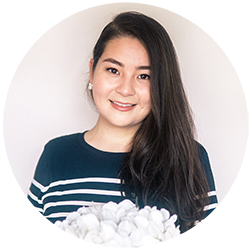 I always hear such good things about Korean products, and what you have showed looks so good! This is the Korean haul of my dreams! I am absolutely adding that NEOGEN product to my wishlist. I've been loving the Gauze peeling pads and really want to get more into that brand. Awesome haul! I would love to try these Korean products!